Few can argue that the Houston Astros on field performance last season was abysmal at best and criminally negligent at worst with a group of unproven young prospects being thrust into the roles of Major League Baseball players and proceeding to lose more games than any other Astros team before them had done. To be fair it was not the fault of the players that they were put into the situation of being over matched throughout much of the 162 game Major League Baseball season and the past few seasons have each included over 100 losses. The players fought hard and are certainly to be commended for how they handled the cards they were dealt and while there were certainly many cringe worthy moments there were also a few moments that helped give hope for things to come. 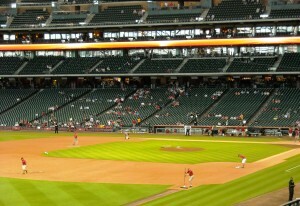 Empty seats and losing records are both common these days at Minute Maid Park. In fact the hope for better things to come and be patient with us as we rebuild lines became the mantra that the Astros front office repeated time and time again. Tired of watching the Astros lose? Be patient with us as we rebuild and hope for better things to come management would reply. With abysmal performance on the field, and the lowest payroll in all of baseball, one would think that the sole focus of the team’s management during the offseason would be improving on field performance. They would be wrong. Instead of focusing on the on field issues that made the baseball team representing the nation’s fourth largest city a laughingstock, the current ownership is suing the former ownership for breach of contract, fraud, negligent misrepresentation or omission and civil conspiracy. As part of buying the Astros two years ago the current ownership group also purchased a 46 percent share in CSN Houston from the former team ownership group. 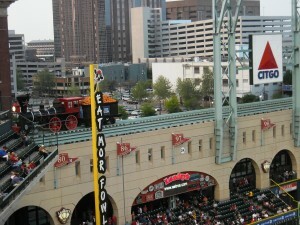 Once upon a time under the old regime there was a Ballpark with a train and a grand view of the Houston skyline. CSN Houston is the channel that airs all of the Astros games as part of the team’s regional sports partnership. Currently CSN Houston is still only viewed by about 40 percent of the Houston market. This is an issue when one takes into account the new nature of baseball where teams count on revenue from television deals to help fund the day to day operations of the franchise. The more money a team receives from television, the more money they can spend on players who then appear on the television. Or so the business model goes. During a news conference at Minute Maid Park last week the current Astros owner stated that the ball club has lost tens of millions of dollars and “perhaps hundreds” of millions because of a business plan for the television network that was based on what they feel are “inflated numbers” by the former Astros owner and others involved in the ownership group of the network. Now it has been awhile since I owned my own company but I am pretty sure that running a business has not changed that much in the last decade to the point where one could not tell if they were losing tens of millions of dollars or hundreds of millions of dollars. 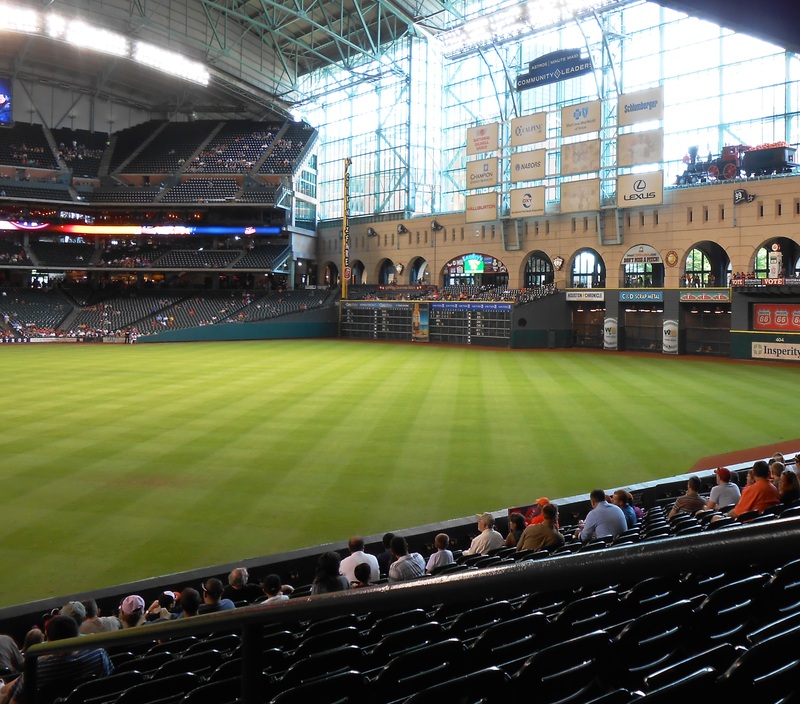 If the current ownership of the Astros cannot tell the difference then boys and girls the problems at the ballpark built at the old train station are bigger than we all thought. For his part the current owner has said that his team went deep into the books of the team prior to purchasing the team. 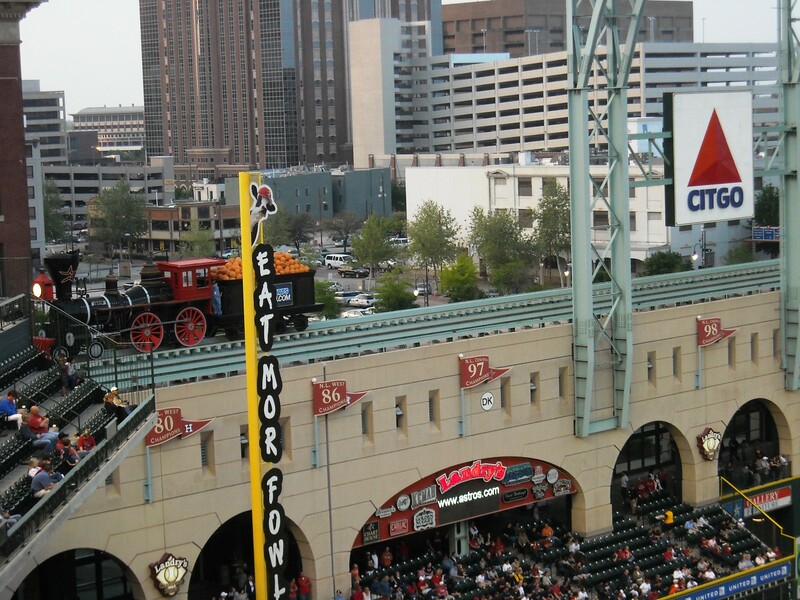 Under the current Astros leadership the view of the skyline has been replaced by billboards that seem better suited for the side of the road as opposed to a Major League Ballpark. So if the books were looked at and the team was still purchased it would seem to me that the new ownership was happy with what they saw. Two years after the fact when things are not going their way under the current watch it seems counterproductive to blame issues on prior management. Of course this is exactly what seems to happen these days. Take for example the world of college football. Coaches usually have a two or three year window where they can blame poor results on the previous coach since the players on the field were recruited by a previous regime. In Washington D.C. it is common to blame things going poorly on a previous Presidential administration. Of course, in the event that a new coach wins with someone else’s recruits or a new president finds success with the policies of their predecessor credit is really given to those or set them up for success. So it is with the current situation the Astros find themselves in. Time after time I have heard the current ownership group say what a mess the farm system was left in by the previous owners. And yes, an argument could be made that after years of neglect an overall of the farm system was needed. But had the farm system been left in a pristine condition it is highly unlikely that any credit would be given by the current owners to the former owners. Indeed it is far easier to blame issues on others than to look in the mirror and see that perhaps the issue lies within. After two years under the new ownership group the Astros really are in no better shape than they were under the former regime. In fact one could argue that they are actually in worse shape with drops in attendance and 60 percent of the fan base unable to watch any of the games from home. 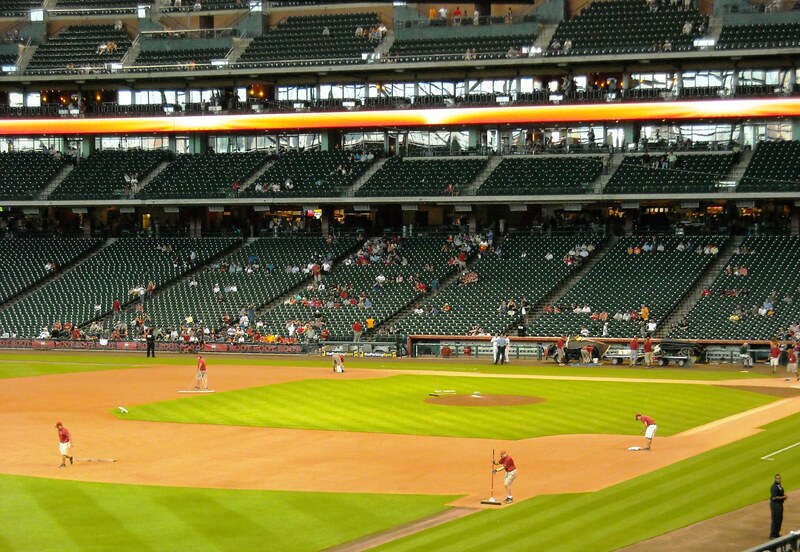 And of course for those fans who do make it to the ballpark they are greeted by increased ticket prices, dynamic ticket pricing for the popular games, and an obstructed view of the Houston skyline thanks to billboards that look better suited for a Minor League Ballpark than a Major League Ballpark. I am not qualified to pick sides as to whether the owner of Astros past or the owner of Astros present is to blame for the current state of the team. It very well could be that the former ownership group is to blame for the current state of the franchise. It could just as easily be that the current ownership has bit off more than they can chew and feels that blaming the former owners is the best way to draw attention away from that. I do know that unless something changes soon the owner of Astros future will be brought in and no one will get a holiday goose. Okay, perhaps that was a bit too much Charles Dickens for one night. Victorian literature references aside, it will be up to the courts to decide whose side is the most truthful in the tale of two owners and whether it will be the best of times, or the worst of times. Until then the offseason for the Astros will be as muddy as the regular season with finger pointing, accusations and pleas for fans to be patient and to temper their great expectations. There is of course a shelf life on patience and for many fans who have watched beloved traditions fall by the wayside that expiration date is quickly approaching and one does not need to be visited by three spirits to see that. Now if you’ll excuse me, I have the urge to read some Dickens for some reason.